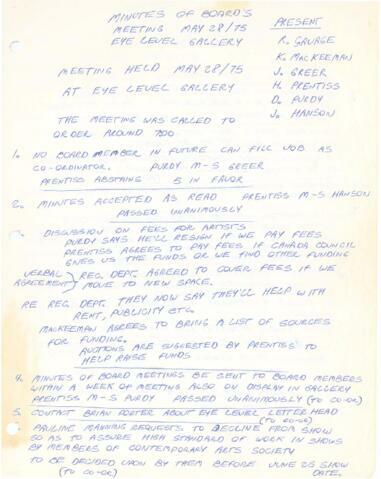 Item is minutes from the board's meeting on May 28, 1975 at the Eye Level Gallery. Members present included Roger Savage, K. MacKeeman, John Greer, Hatti Prentiss, D. Purdy, and Joyce Hanson. The main issue discussed the resignation of the Coordinator, therefore the board voted that no board member could fill the coordinator position, which would have its own selection committee. 2 pages of handwritten notes on acidic and stained paper.